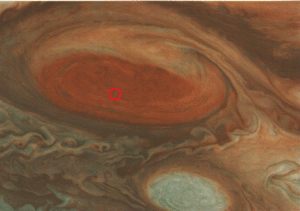 Great Red Spot on Jupiter. Special Containment Procedures: Due to SCP-2399's location and nature, physical means of containment are currently impossible. Implanted Foundation agents in major observatories are to contain footage or images of SCP-2399. An ongoing misinformation campaign is in effect, which has thus far been able to completely suppress any knowledge pertaining to SCP-2399 from public awareness. Foundation satellites in orbit around Jupiter are to maintain constant vigilance of SCP-2399's reconstruction efforts, and make all attempts to hinder that process should SCP-2399 reach a minimum of 75% completion. Additionally, a perimeter of long-range electromagnetic jamming satellites (BARRIER Array) has been situated in high-Jupiter orbit. Any transmissions intercepted by this array are to be summarily decoded and logged. In the event of SCP-2399 surpassing 75% completion or an information breach in the jamming perimeter, necessary Foundation personnel will engage Protocol LEGIONNAIRE-5 (See Addendum 2399-L5), given its completion by that time. Description: SCP-2399 is a massive, complex mechanical structure currently located in Jupiter's lower atmosphere. 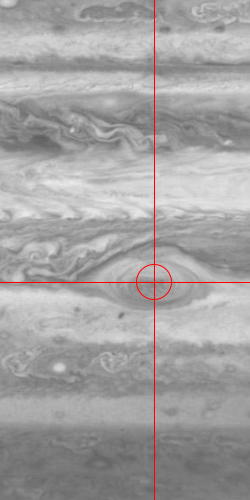 Since its visual discovery in 1963, SCP-2399 has been observed to use highly advanced, anti-matter-based weaponry to create spacial disruptions and devastating atmospheric [DATA EXPUNGED] observable as a large red vortex, commonly known as the Great Red Spot. SCP-2399 appears to be damaged, possibly due to an impact with the moon Io before coming to rest in its current position. SCP-2399 has been observed releasing a multitude of small, octopoid repair drones in efforts to repair the damage it has taken. Some of these drones will remain near SCP-2399, while others will patrol nearby moons, or deeper into the gasses of Jupiter itself, in search of parts that SCP-2399 is missing. Computer models estimate that SCP-2399 is at 59% completion, with a current rate of .78% annually. This rate has increased from an estimated .12% in 1970. Despite its damaged state, SCP-2399 seems to possess a limitless power supply, advanced electromagnetic shielding, matter-disrupting weaponry, the ability to repair damage done to itself, and a precise tracking and targeting system (See Addendum 2399-2b). Due to the large difference in technological advancement between the creator of SCP-2399 and our own, for all intents and purposes, SCP-2399 is currently indestructible by human means. In theory SCP-2399 might be left vulnerable by a powerful enough electromagnetic pulse. Unfortunately, this technology does not yet exist. Since 1971, SCP-2399 has been the recipient of an unending stream of electromagnetic-based communications originating in the Triangulum Galaxy, roughly 3 million light years from Earth. The means of SCP-2399's travel to our solar system, and the means of its communications, are all unknown. From 1971 to 1985, SCP-2399 continuously received a single encoded message which, through codebreaking and translation efforts, appeared to be a command to repair the damage it incurred upon entering our solar system. After this time, the BARRIER array was established to intercept these messages. This coincided with a period of radio silence from the origin of the communications, until 1996, when a different order began transmitting. The BARRIER array has thus far prevented SCP-2399 from receiving this command (See Addendum 2399-Comm-Log). I took Peter to my observation point last night, but a week from the night I saw the fire rain upon Jupiter in the heavens. He brought along his own looking glass, and together we aimed our view upon the giant. To our surprise, a magnificent change has occurred! Where once the distant world only showed bands of color, there is now a great red spot where the star came to rest on the surface of Jupiter. Peter was incredulous, of course, that such an amazing discovery could have taken place before our very eyes. I will continue to take note of this. Tonight as I peered through my looking glass, I swear on my life that I observed what looked to me like explosions and starbursts emanating from our red spot. I fear my mind is playing tricks on me, for there has been no record of such violent outbursts by a heavenly body since the dawn of astronomy. I will consult with Peter on the morrow, and hopefully glean from him some advice on the matter. Batteries were discharged; however, the drone appeared undamaged. Footage obtained by BARRIER Unit 53 shows that, while the payload in question was launched towards the repair drone, it was destroyed within 5 km of the target by additional charges originating from SCP-2399. Command lost contact with BARRIER Unit 45 15 seconds after initial discharge, with video observation showing SCP-2399 [DATA EXPUNGED] the resulting spacial anomaly originating in ████-██-████-█ [DATA EXPUNGED] the termination of BARRIER Unit 45 by BARRIER Units 44, 51, and 55. Have you ever sat and wondered, maybe after you hear about a car accident on a street you were just on, or a bombing in a city you were visiting, just how lucky you are to be alive? Just how many things have to go right for you to continue to exist? A few seconds too late, a few seconds too early, and somebody reaches for something they dropped and a busload of people run into another busload of people. Sometimes this kind of thing does happen, as we've seen, far too often. But that's what we're here for. To protect those who can't protect themselves from things that they wouldn't even know to protect themselves from. 1. The repair of SCP-1396 has been proposed, but has been deemed currently unfeasible.